Generally speaking, kitchen space is one of the toughest rooms in the house to keep it nice and tidy. Moreover, the kitchen countertop situation can be especially challenging. Even though you may don’t want to admit it, it’s quite essential to keep the kitchen functional and neat because this is where we spend lots of time cooking, chatting, having a breakfast, homework when at home. It is unquestionably the heart of our house! The problem with kitchen counters is that they are often the most spacious flat surface in the house. As a result, loads of stuff, such as books, mail, newspapers, groceries, that should not be there, end up exactly on the kitchen countertop. And let’s face it – having cluttered countertops surely blocks the use and enjoyment of your kitchen. Luckily, I have prepared 24 great ideas to declutter the kitchen to bring sanity back there! Have a look! To start, here is a smart and elegant idea — why don’t you keep the hot plate area free with a repurposed cake stand to hold some of the cooking ingredients (such as olive oil, salt & pepper, sugar etc.)? 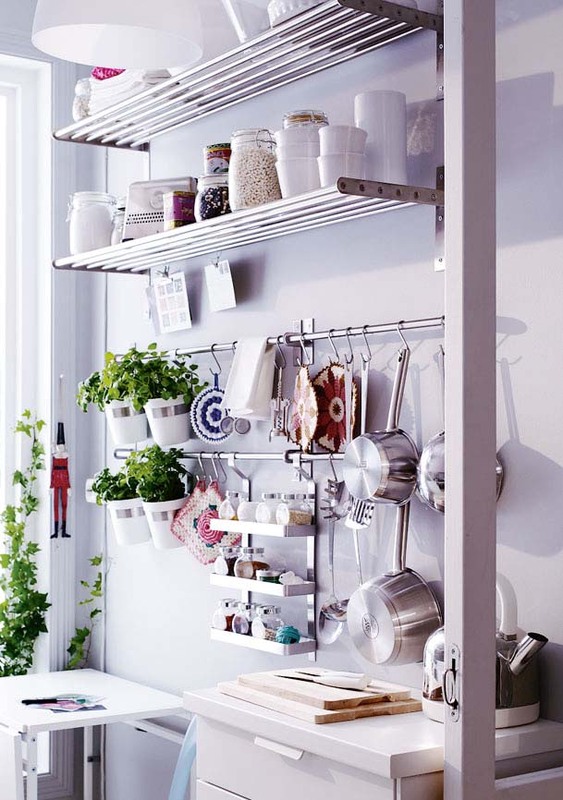 Another great idea for a clutter-free kitchen is to exploit that vertical space somehow. 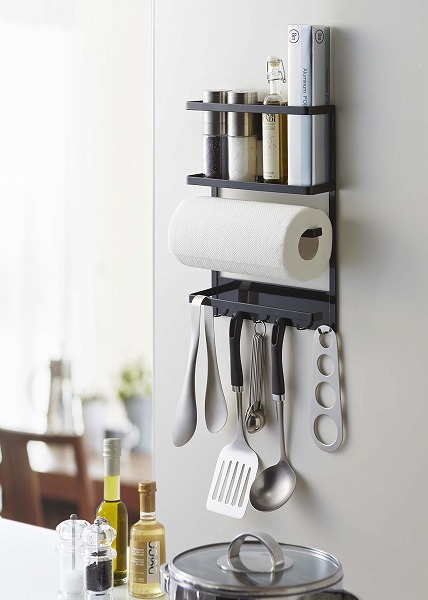 See, it is very practical as well as giving the kitchen space a bolder, funnier look. This small wooden, IKEA style stand could work as an excellent kitchen countertop organizer! In this way, you will be able to arrange the canisters and save some space. Congrats to the blogger Anne Hepfer who created this lovely ‘stash’ to hold bottles, dishes, and scrub brushes. Keeping the sink area free will brighten up the whole kitchen space, trust me! Is your family loves drinking teas? 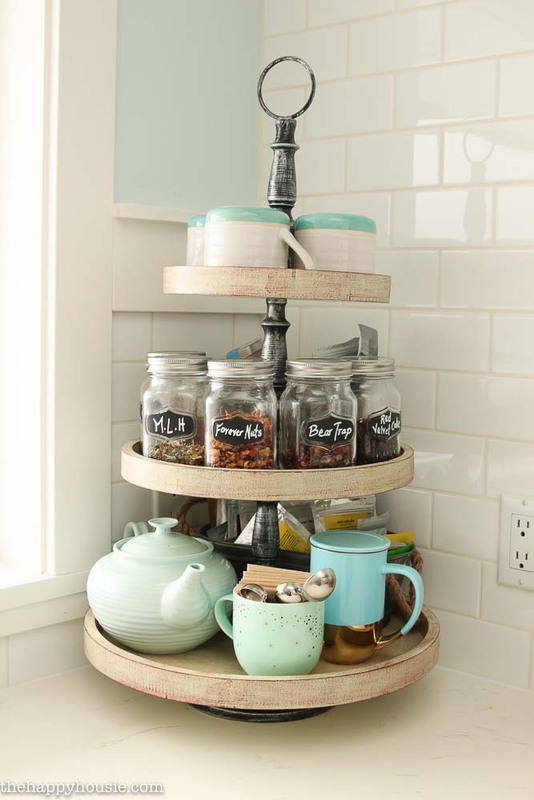 If so, why don’t you re-create this lovely “tea station” by using the old 3-level cake stand you never need? 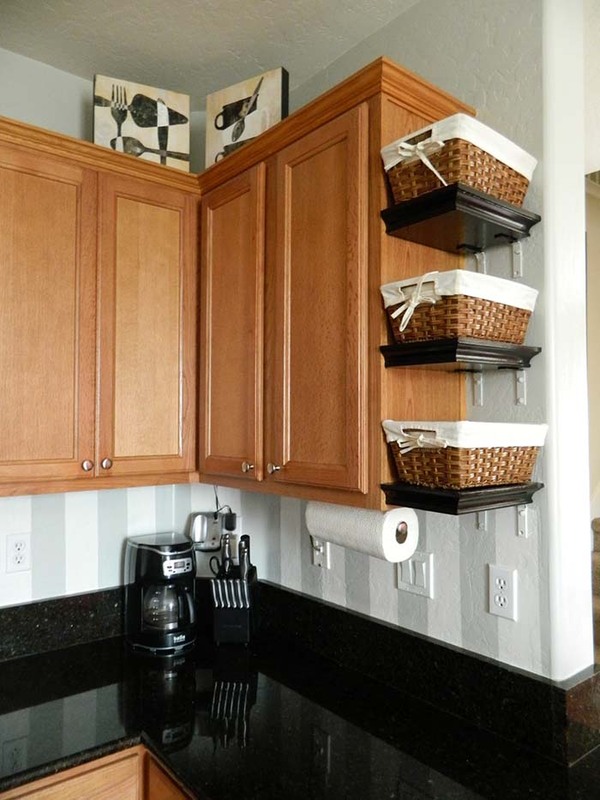 What do you think of hanging a bunch of wire baskets on the side of the kitchen island? 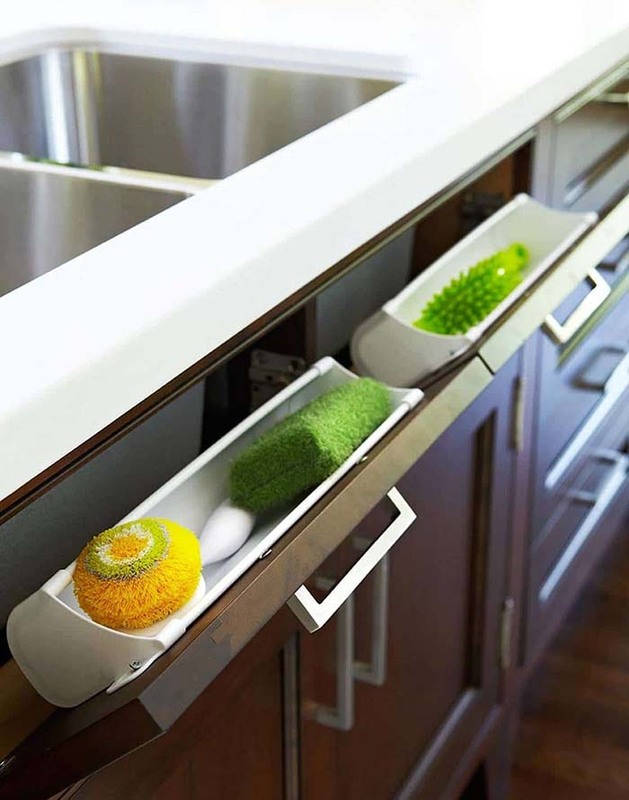 Meant for magazines, newspapers and shopping bags, it does surely works to declutter the kitchen countertop. 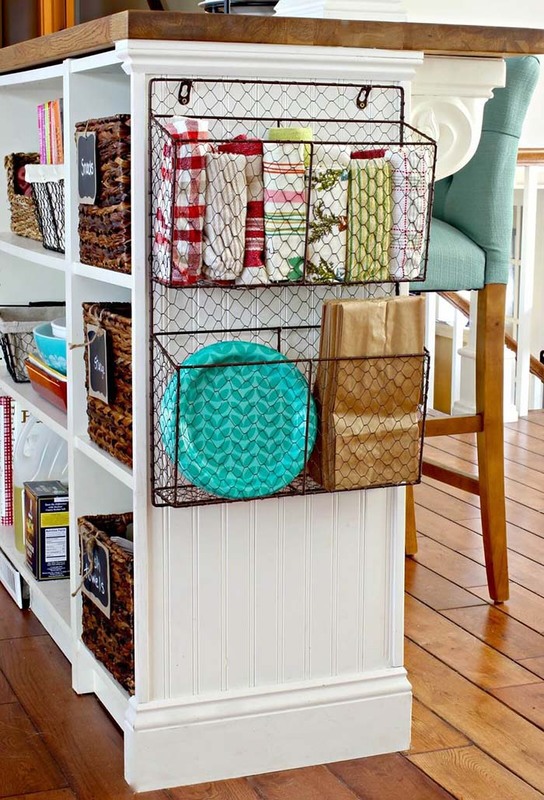 There is another easy and affordable hack for a clutter-free kitchen. 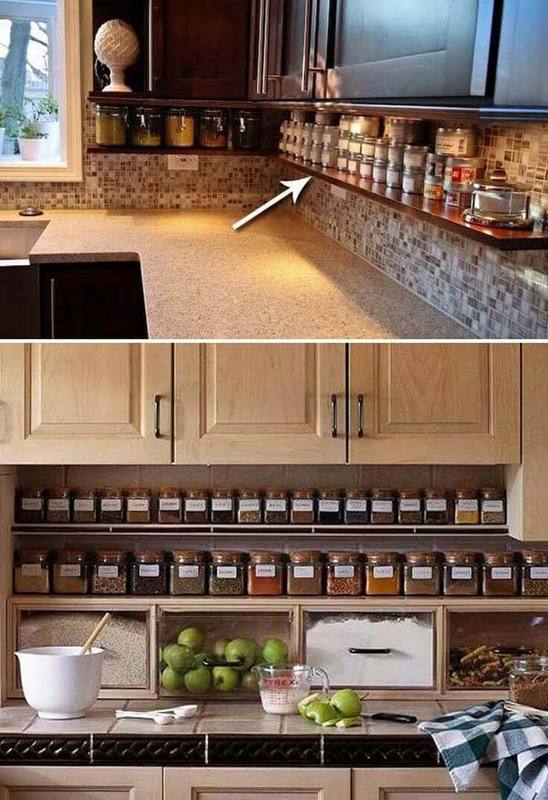 This spice jar shelf under the counter is both appealing and practical for cooking, don’t you think? Containers of spoons and spatulas are easy to grab, for sure, however, they often get in our way. 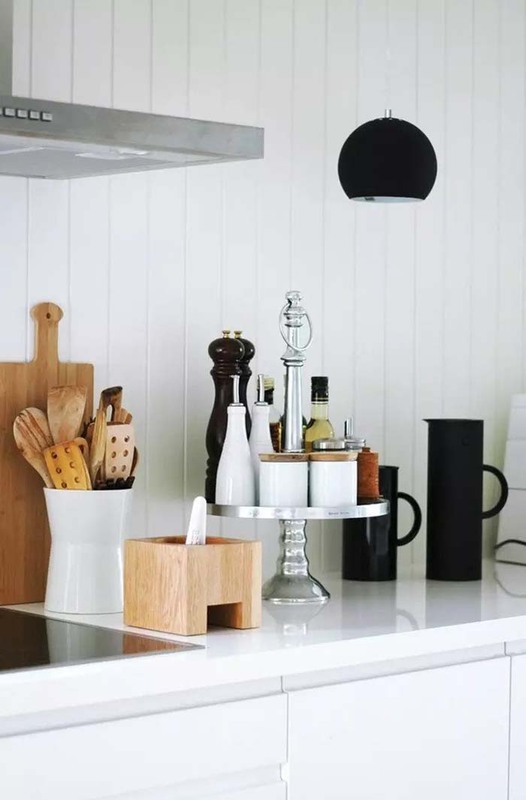 In this Nordic style kitchen, a few workhorse utensils hang neatly with a magnet to the fridge. 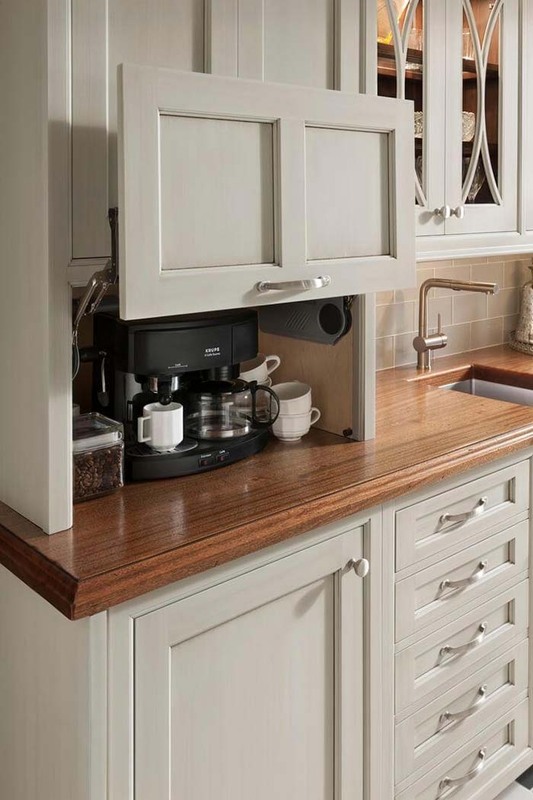 The area around the coffee machine is usually untidy and covered with coffee. Worry no more! You can easily hide it by installing an additional, movable cupboard door. 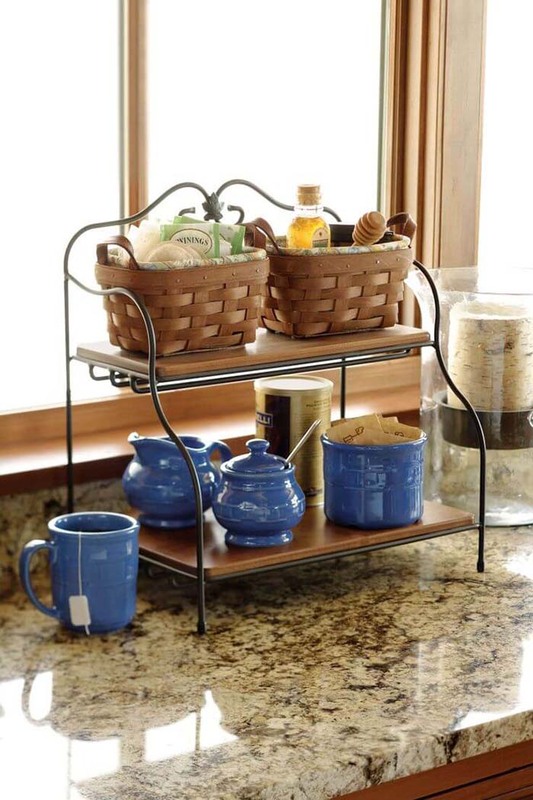 This lovely, two-level shelving unit is very practical as it can works as a kitchen countertop organizer as well as to be carried to the living room when you invite guests for a cup of tea. Using the backsplash area is an excellent way to keep your counters tidy. Moreover, these baskets are usually being offered in various sizes so they can fit your needs. 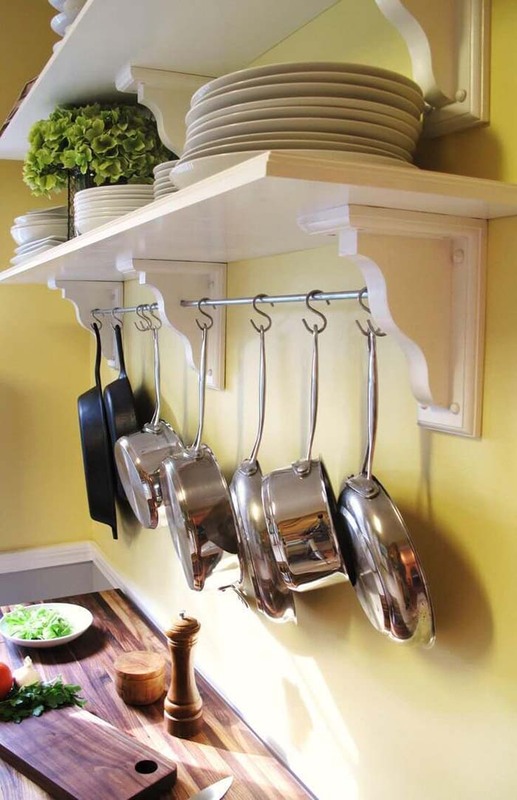 Can you imagine this lovely, tiny backsplash shelf is entirely made out of corbels? 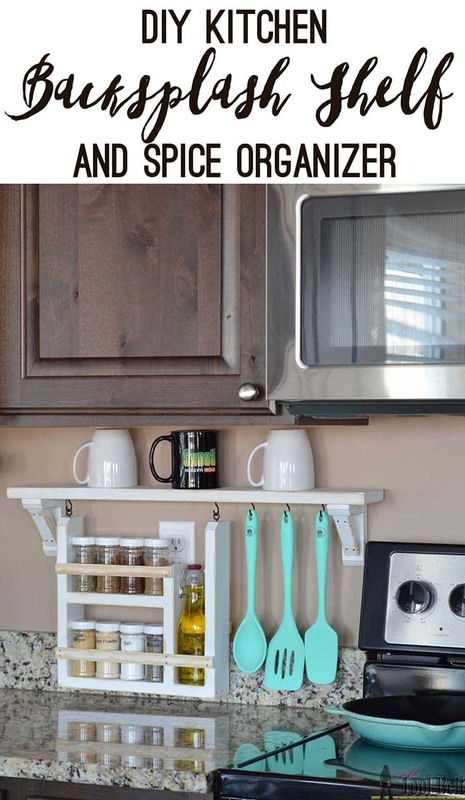 It is an amazing way to organize your regularly used kitchen gadgets and declutter the kitchen countertop. The good thing about many IKEA items (apart from the design and the price), is that they are very versatile furniture or accessories. 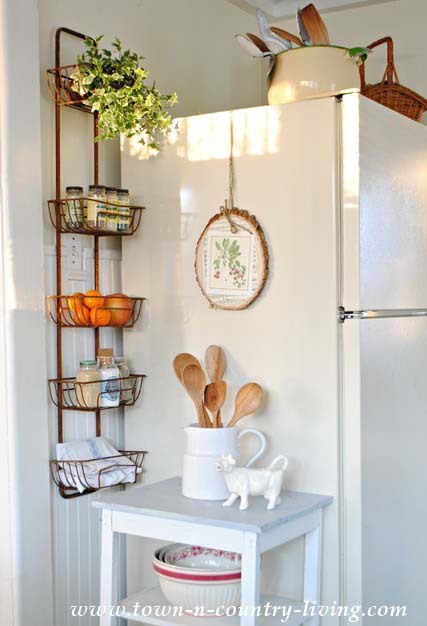 Its series of metal hangers and shelves are so practical for hanging potted spices, spoons and spatulas, as well as spice and tea jars. 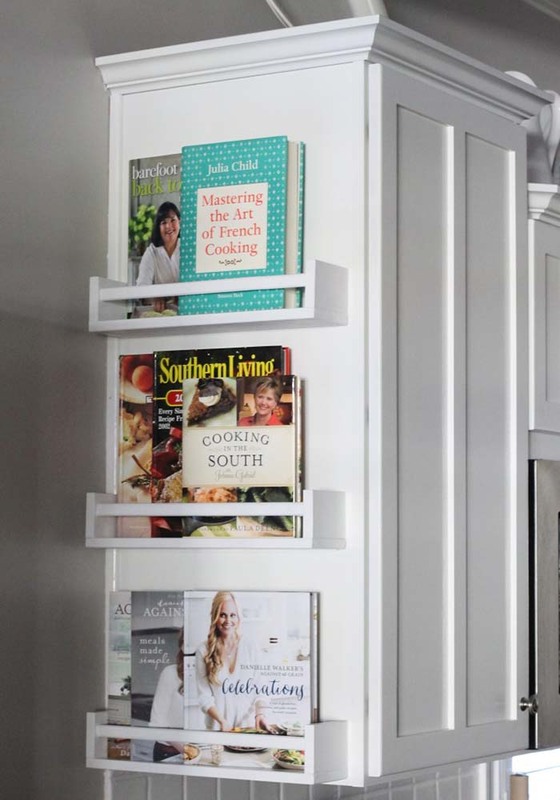 A simple spice shelf could perfectly work as a cookbook storage and help you utilize the vertical space in a smart manner. It is a tiny tany improvement, however, it makes a solid statement in the kitchen space. 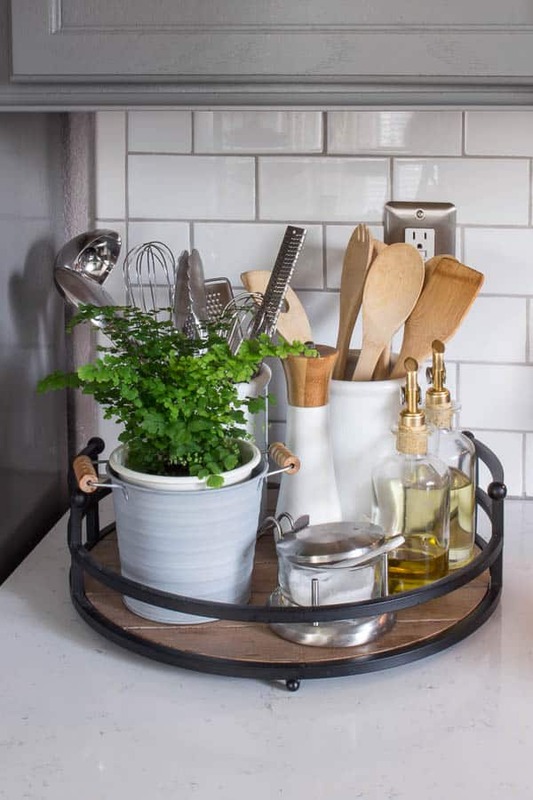 This organized oval tray received its own mini potted parsley to add a delicate pop of green. Lovely way to keep the oven area nice and tidy, right? To me, this is a contemporary version of the old-school hanging fruit basket every home used to have. 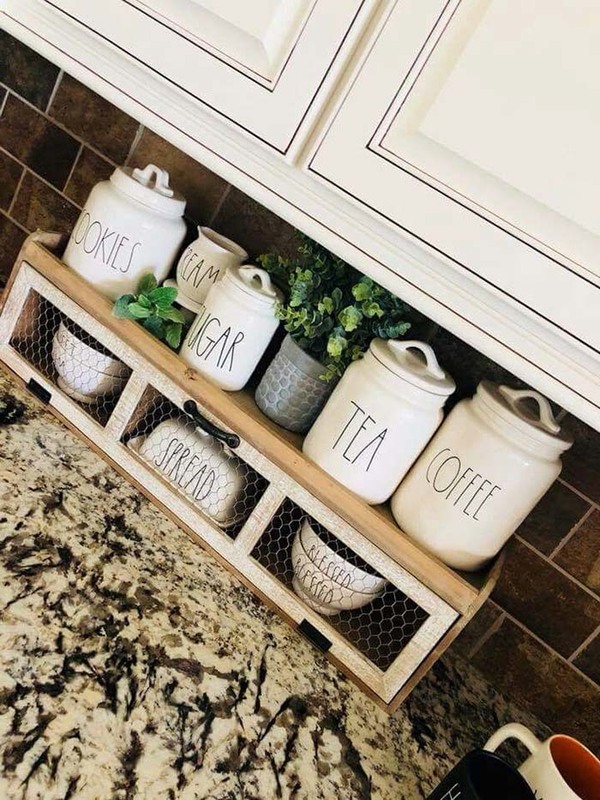 You can use this kitchen countertop organizer for everything, including fruits, spice jars, kitchen towels and many more. 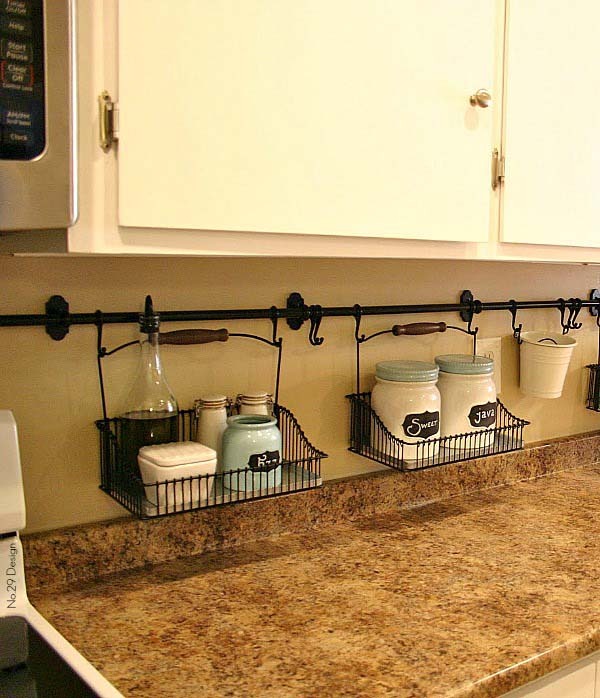 Add some style to your kitchen countertop with the industrial pipe pot rack holder. It is not just very practical, but it also fits various interior design styles – from modernistic to classic, farmhouse kitchen. 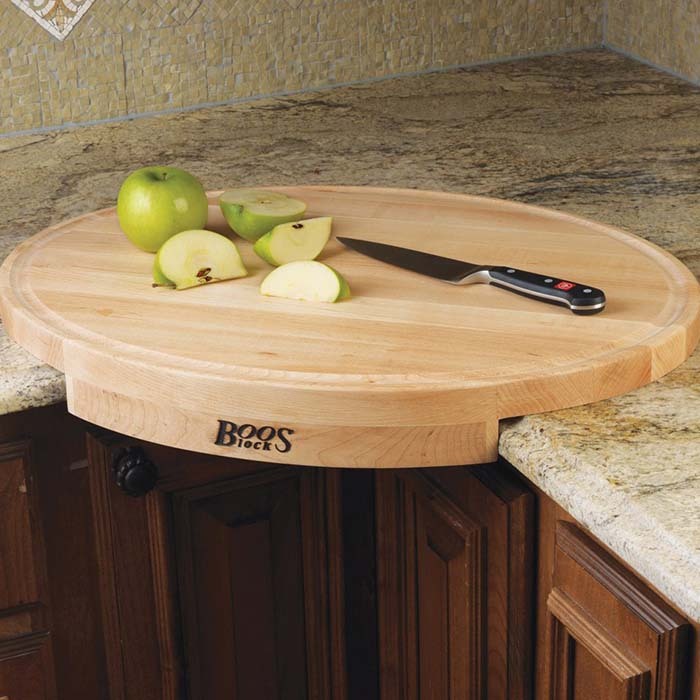 Have you ever seen a corner cutting board like this one? The bestie of every clutter-free kitchen! With added stability, this is the perfect extension to your tight kitchen corner. Here is an easy DIY project for every newcomer in the crafting world. 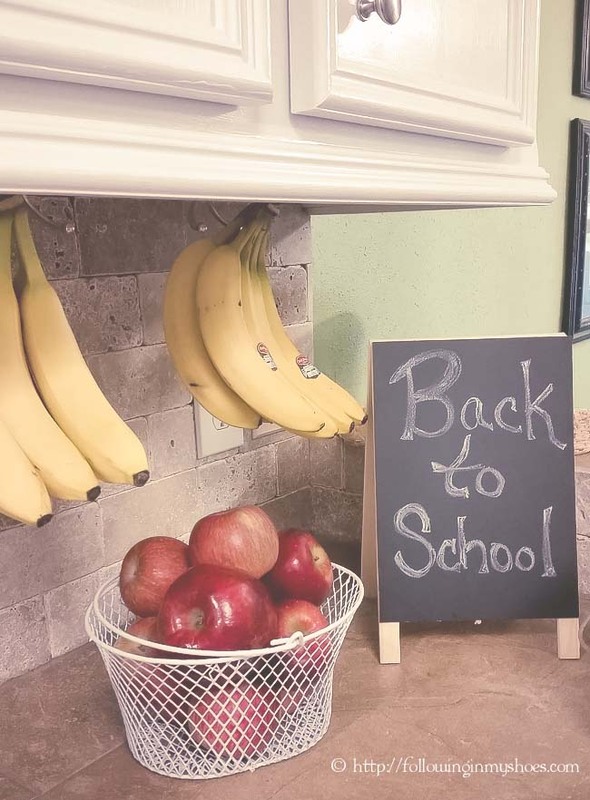 These fun banana crooks are in fact metal backpack wall hooks, being screwed into the underside of the kitchen cabinet. 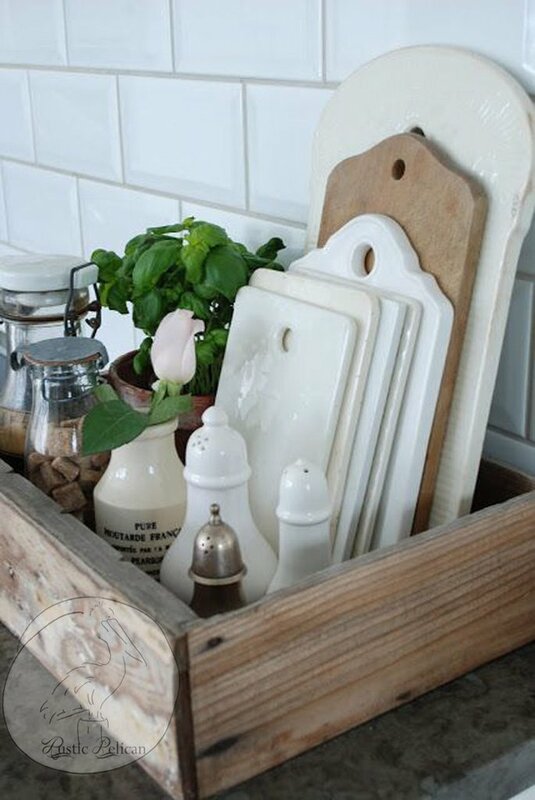 This reclaimed wood tray to store the cutting boards and cooking ingredients is an ideal fit for every rustically chic kitchen. Adding a splash of greenery will make a nice contrast with the wooden material for a more appealing look. 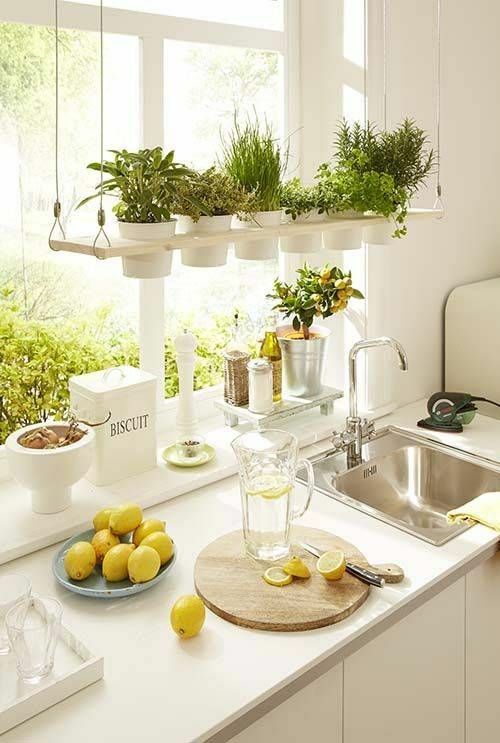 As this kitchen gets a lot of sunlight every day, it surely was a good decision to let the potted herbs hand above the sink. In this way, they are near at hand and they bring to the kitchen space a lively, fun vibe. I was dying to share this project for a clutter-free kitchen with you! 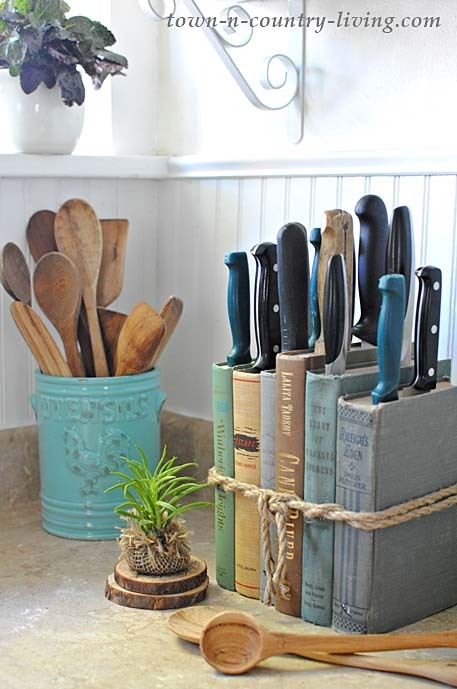 The DIY kitchen knives storage is made out of old books tighten up with a rope. It is a very conversational and unique feature to this kitchen. 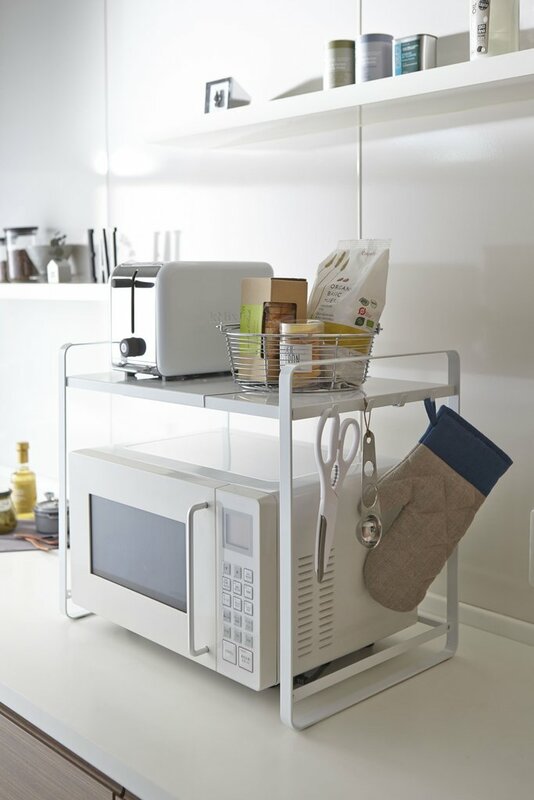 This open, Scandinavian-style shelf above the microwave could be a great storage for cook books, as well as the toaster. I know that it’s not easy to declutter kitchen which is a hot mess, but don’t give up, there is always something to add up! 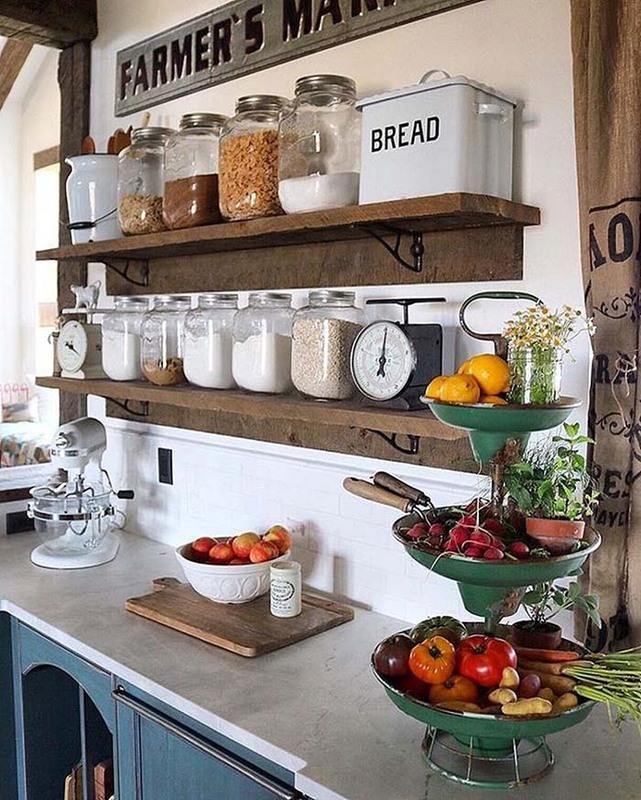 There is no better way to store these large jars with food ingredients than building two-level shelving above the kitchen countertop. Now you will have all the space in the world to prepare your family’s favorite meals in an entirely clutter-free kitchen. Which one of these smart hacks for decluttering the kitchen countertop did you like most? Will some of them fit your current kitchen space design?